Bringing any animal into your home and family is a financial commitment for the lifetime of the animal. Our adoption consists of a non-refundable $50 application fee and $350 at the time of adoption. Your adoption costs are just the beginning, and it is reasonable to ask what services are included in the adoption, and what additional expenses will be required by the adopter. Pet supplies such as food, dog bowls and dog beds. All pet vaccinations, including rabies* vaccine. 1 month of heartworm preventative medication. A new “greyhound-safe” collar with matching leash. A lifetime of advice and support from GPA-WI. A guarantee to take the dog back at any time during the life of the dog should it be required. * Some group activities such as obedience classes, boarding or doggy daycare may require a bordatella or kennel cough vaccination, which is not covered by the adoption fee. Note that in some cases, depending on the dog and on the specific home environment where the dog will be placed, GPA-WI will require that a crate be purchased. Contact GPA-WI for the correct crate size before making final arrangements to obtain the crate. Please note that GPA-WI does not perform on-site, on-the-fly adoptions. 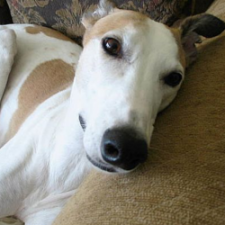 GPA-WI cannot guarantee that any specific greyhounds listed on the adoptable greyhounds page online will be available once you go through the GPA-WI adoption process. To learn about GPA-WI’s adoption process and screening for new adopters, visit the GPA-WI adoption process webapge: click here.